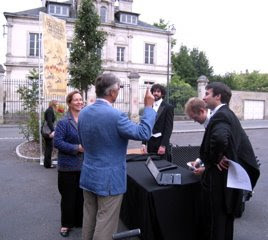 Philippe Toussaint, President of this festival and the Federation Francaise des Festivals Internationaux de Musique gives his reaction to Brian, Gabe and Adam as they pack up the CD table. We left right away for an overnight at Charles De Gaulle airport and home tomorrow. It's been great, but we're looking forward to going home. Thanks for joining us and see you soon.